Offering you a complete choice of products which include suction pads, plastic films suction pads and chocolate suction pad. Vacuum components systems from Schmalz permit decisive productivity improvements in automated processes. Be it in mechanical engineering or in the robot industry - Schmalz customers in all areas of automation technology profit from our qualified system consultancy services and our groundbreaking, innovative solutions. The range of workpieces which can be handled with vacuum extends from easily damaged, small parts such as electronic chips or CDs to furniture elements or heavy sheets of steel. Suction pads from Schmalz can be divided into universal suction pads and suction pads for special applications. Universal suction pads cover a wide range of requirements. 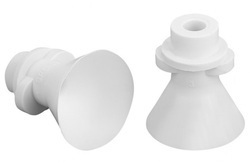 Suction pads for special applications were developed to meet the requirements of individual industries. They may be characterized by special properties, such as the handling of thin-walled and greasy body panels in the sheet metal industry or of porous and structured workpieces in the wood industry. The flat suction pads SGPN are specially created for handling with various packing materials (plastic foils, paper, blister-packed). Through his flat, long-tapered sealing lip he has good sealing properties. This flexibility enables the handling of non-rigid packed products. When lifting the workpiece, the packaging deforms and crinkles occur. These can be reliably sealed by the sealing lip and the workpiece can be transported safely. The SPG suction pad has an extremely thin and supple sealing lip that provides an optimal seal for both smooth, glazed chocolate bonbons and structured surfaces. The tapered suction pad geometry ensures that round and square chocolates are completely enclosed and securely held under maximum dynamic pressure. Even chocolates with fillings are moved at high process speeds without being broken. The bell shape securely encloses the chocolate while low vacuum values of -100 mbar prevent the fluid that is underneath the chocolate shell from leaking. The high nominal flow of the suction pad ensures that the required operating vacuum is quickly formed and that leaks that occur when moving highly-structured chocolates are optimally compensated. Looking for Suction Pads ?